With Christmas coming closer every day our house has turned into a bakery on the weekends! The kitchen counters are littered with flour, sugar, sweetened condensed milk, Ameri-Color Gels, piping bags, and anything else I might need to make and decorate cookies and sweet treats. I love this time of year and the smell of our house from all of the treats baking in the oven. Plus I’m excited to share this recipe! I’ve been on a quest to make a good gluten free sugar cookie. I had a good one I’ve been using that tastes decent but it is really delicate and easily falls apart. After 3 or 4 trials I think I found a keeper! The basis for the cookie dough is a good all-purpose gluten free flour. So many out there taste chalky or grainy but I’ve found my favorite to be Mama’s Almond Blend All-Purpose Gluten Free Flour. Then I added some brown rice flour, potato starch, and tapioca flour. 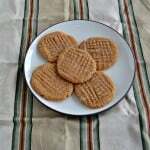 I really liked the texture and the cookies were firmer. 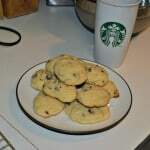 My husband even enjoyed them which is saying a lot because he isn’t a fan of my other gluten free cookies! I first used this dough to make a custom order for Lego cookies. I had never made them before but the designs were really simple. 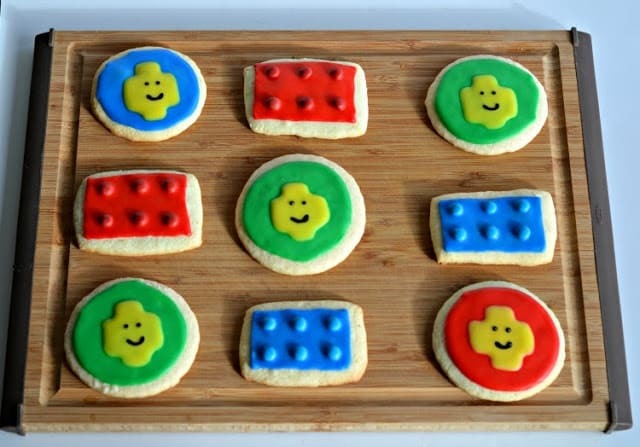 The actual Lego’s were made out of rectangle cookie cutter that were covered with royal icing and had mini M&M’s for the bumps. 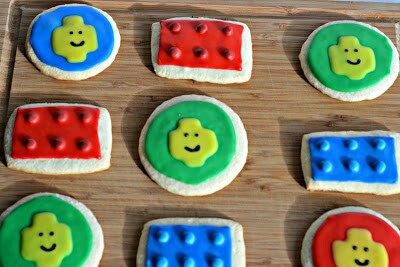 The other cookies were round and topped with yellow royal icing to look like a Lego man. 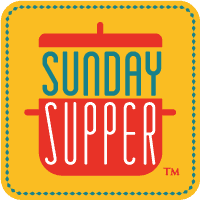 This week the #SundaySupper theme is “We’ve got you covered”. I’m sharing these gluten free cookies to “cover” any of my gluten free friends this holiday season. Make sure to check out all of the other ways we have you covered this week! 1. In a large bowl beat the butter and sugar with a mixer until well combined. Add in the eggs, one at a time, and mix well to combine. Stir in the vanilla. 2. In a medium bowl combine the flours, potato starch, baking powder, and salt. 3. Add the flour mixture to the butter and sugar and mix well. Pour the batter onto a sheet of plastic wrap and wrap well. Refrigerate for at least 1 hour or up to 6 hours. 5. Sprinkle gluten free flour over your work surface. Pull off about a third of the dough and sprinkle it with the gluten free flour. Roll the dough to 1/4 inch thickness. 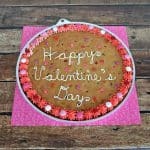 Cut out with cookie cutters and place on a baking sheet. 6. Bake for 9-11 minutes or until the cookie looks firm but is not brown. Remove from oven and allow to cool for 1-2 minutes before removing to a wire rack to cool completely. Repeat with remaining cookie dough. 7. Once the cookies have cooled completely decorate with royal icing. 8. To make the Lego cookies make a batch of royal icing and divide into 4 bowls. Dye one red, one yellow, one blue, and one green. 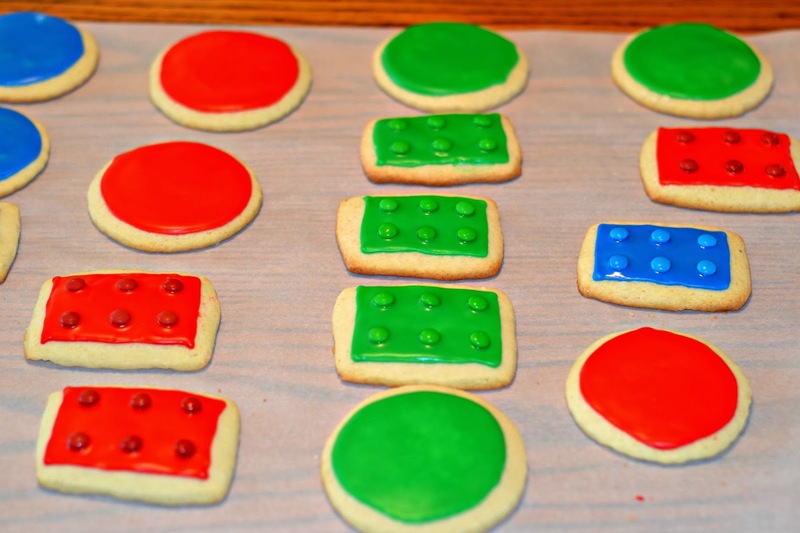 Outline each cookie in either red, yellow, or blue. 9. 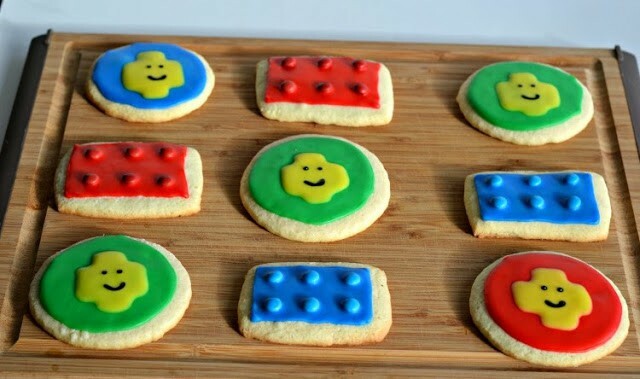 To make the Lego’s, flood the cookies with royal icing then place 6 mini M&M’s (M&M side down) on the cookie to make the bumps. 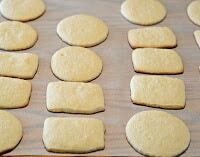 Flood the circular cookies and allow to dry for 20 minutes. 10. Fit a piping bag with a number 2 or 3 tip and fill bag with yellow icing. 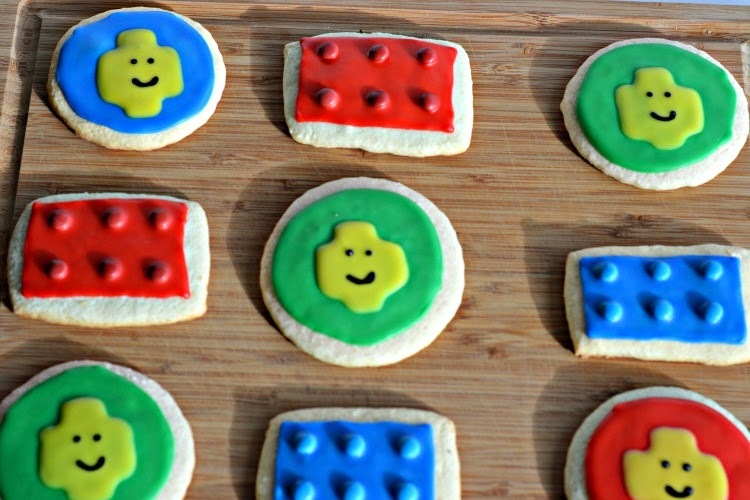 Pipe the outline of a Lego man head on each circular cookie and then flood with yellow icing. Allow to dry for 15 minutes. 11. Place the remaining yellow icing in the bowl and color it with black Ameri-Color Gel. Place in a piping bag with a number 2 tip and pipe on 2 eyes and a smile. Allow cookies to dry for 24 hours. Those are just the cutest cookies! What a hit they would be with the kids. Oh my gosh, how cute!! What a great little cookie to have a kids party!! I just love them!! It’s awesome you made gluten free sugar cookies. So many people need to be gluten free and they shouldn’t be left out of the holiday fun! What a lovely Christmas gift, Heather. Thank you! 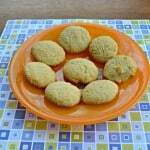 Your gluten free sugar cookies recipe is a keeper! Hehe! These are adorable! My husband loves Legos and I know he’d get a kick out of these! My grandson is really into Legos right now he will love these! These look so awesome! I think they would be perfect for my son’s birthday. Our kids are going to LegoLand next week, this would be an awesome snack!